Supplies and rents snooker tables, hockey tables football tables but specialises primarily in pool table sales. The website has many top slots on the major search engines and this business has seen an ongoing increase in sales. Tim Franklin snooker and pool table services has a large showroom in Bristol and has been offering its services since the early 1980's. The company has seen considerable growth since the launch of the website and now ranks highly on the most important search engines for literally hundreds of keyword combinations. Visit website - Click image or link to left to visit pool-and-snooker.com. 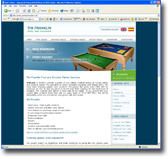 Whilst not utilising the Internet to its full potential due to the lack of a shopping cart system, the website shows this company's large range of pool tables and other related products in an easy to use format and has seen thousands of visits every month over the past few years partly due to its outstanding ranking on the most important search engines. "I am amazed at the results this has brought my business for such a small investment - the hits and sales keep coming. No hesitation at all to renew my annual hosting account or stay with you for ongoing updates" For reference - Call Mr T Franklin on 0117 983 5511. If you would like to join Tim Franklin snooker and pool table services and are interested in our web designing or search engine optimisation services - contact us. We recommend reading building a website first to gain a better understanding of marketing your business on the Internet and working with a web design company. We are particularly interested in hearing from established businesses who would like to convert an "off-line business" to the Internet.